By Nancy L. Witherell, Ed.D. 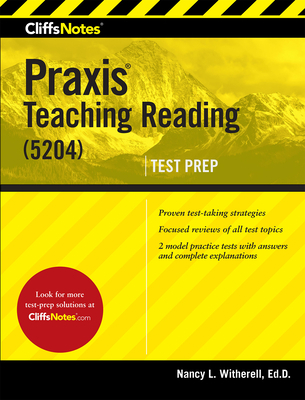 The Praxis Teaching Reading (5204) test focuses on the knowledge and skills a teacher must have to support reading development for entry-level reading. The test is designed for individuals whose preparatory program has included intensive training in the teaching of reading. The test assesses the five essential components of effective reading instruction: phonemic awareness, phonics, fluency, comprehension, and vocabulary. The states that require reading teacher certification using this Praxis subject test include: Alaska, Hawaii, Iowa, Kentucky, Louisiana, Montana, North Carolina, New Jersey, South Carolina, South Dakota, Utah, and Wyoming. This book includes subject review chapters and two model practice tests with answers and details explanations. NANCY L. WITHERELL, Ed.D., is a professor at Bridgewater State University in Bridgewater, Massachusetts, where she teaches undergraduate and graduate reading courses. She has presented at numerous state and national conferences, written a number of books on literacy, and is active in teaching children through numerous consultancies. She lives in Raynham, Massachusetts.